August 29, 2013, 9:16 AM · What size violin does my child need? My friend Heather asked me this question, and I realized, a lot of people must be asking the same thing, either for their young beginner, or for a student who has grown a bit bigger over the summer. Either way, it's important to answer this question correctly. A properly-fitting violin will help ease a student's studies, making the innately awkward instrument easier to handle and hold. We're actually lucky that violins come in various sizes! An octave on a piano is always an octave, no matter how small the hands attempting to play it! There are seven typical "fractional" sizes for violins, from smallest to largest: 1/16, 1/10, 1/8, 1/4, 1/2, 3/4 and full-size. I'm going to give you instructions on how to measure your child, and then a little chart to determine what size instrument you need. 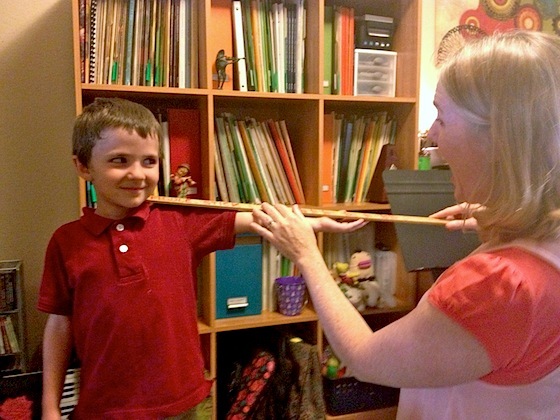 Have your young student stand upright, holding out his or her left arm, palm facing up. Gently measure the distance from the left side of the neck out to the line where his or her wrist meets the hand (in inches or centimeters). 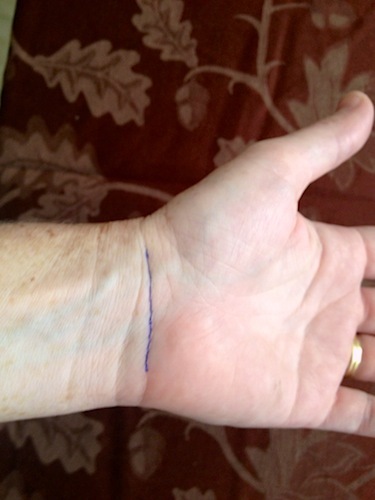 At left is a picture of that natural line at the wrist, which have I darkened with pen, so that you can see what I mean. You can use a tape measure or a yardstick; I use my home-made "Fiddle Stick," a yardstick on which I've marked all the measurements. GUIDELINES: Always err on the side of getting the smaller violin. It is tempting to get the bigger size, figuring, "Oh, (s)he'll grow into it," but it is extremely frustrating for a child to work with an unwieldy violin that is too big, and importantly, too heavy! You want the child to feel in control of the violin. A too-big violin may actually hurt to hold because of its weight, and it may throw off the mechanics of playing because of its size. If you are getting a violin for the first time, all the best on your new musical journey! If you are up-sizing, enjoy the new (likely improved) sound of a bigger fiddle! August 29, 2013 at 02:36 PM · Very handy! August 29, 2013 at 09:15 PM · WOW! This is very nice. Even though I've been teaching a lot of years, I've never heard or seen anything like this. I look forward to testing it out really soon! August 31, 2013 at 09:37 AM · There is a simple to use measuring device available that takes all the guesswork out. Do a search for Vio-Meter.